Before android lollipop most of the apps provides only two or three themes to change at run time because they have already bundled image object for that theme color. I mean images and all selector color are defined and drawable already created with all theme colors because there is no primary color and color accent attribute that allow you to change color dynamically before lollipop. In Lollipop they have add selector that change all objects like edit text and switch with the theme color and that's very cool. All object look similar and contrasting to your theme. So how the app developer change themes run time ? How to change full app theme run time? Well for answer of above questions go through full tutorial and you will learn how application default theme changed with newly selected color at run time. Create activity where user can select theme color. 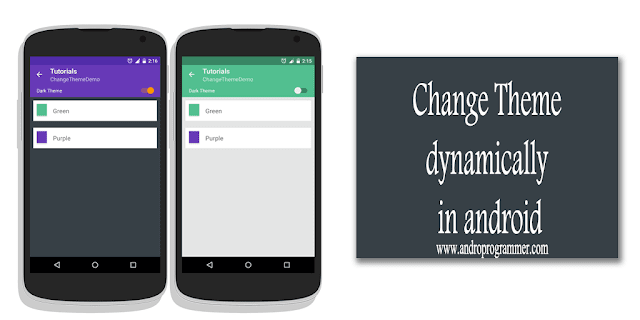 in this tutorial it is ChangeThemeDemo. I have taken only two colors but you can add as many as you want. It is really lengthy process but if you go step by step it will be so much easy for you. Now create theme.xml in values folder where you will define all themes that you want to implement. And user can change theme from it run time. Well now all set, now put below code in Java class in this tutorial it is ChangeThemeDemo.java. where you have to change preference on the basis of user selection. which theme is selected by user and weather light version or dark. * Created by Wasim on 15-08-2015. Add Searching in List View.